Sensory cues like a photograph, a keepsake, a song or even a whiff of perfume can bring back old memories. Martine Mahoney, community support worker at Southern Cross Care (Vic)’s respite centre, Macleod Cottage, regularly comes up with innovative ways to help the older people with memory loss in her care to remember and recall their fond memories. Ms Mahoney takes great pride in her varied role which includes attending to clients’ personal care, meal service and lifestyle program. “I love the diversity of my role. I enjoy coming to work each day, supporting older people and putting a smile on their faces,” she says. Ms Mahoney joined Southern Cross Care in 2014 and it was her passion in aged care that inspired her to set up a Reminisce Corner at the Cottage a year ago. Littered with memorabilia from her travels and selected pieces from her personal antique collection, the space has generated a lot of interest from clients. “People come to this Reminisce Corner, have a fiddle with things, and that usually sparks a lot of wonderful memories and conversations,” says Christine Vice, Coordinator at the Cottage. She says the Reminisce Corner has had a calming effect on the residents, in particular one gentleman who has dementia and who can be a little anxious at times. “He was an avid traveller in the past, that’s why he enjoys looking at the collector spoons on display. It brings back fond memories of his travels and gives him something to talk about with other people. “It’s great that he is connecting with others because of this great initiative by Martine,” says Ms Vice. 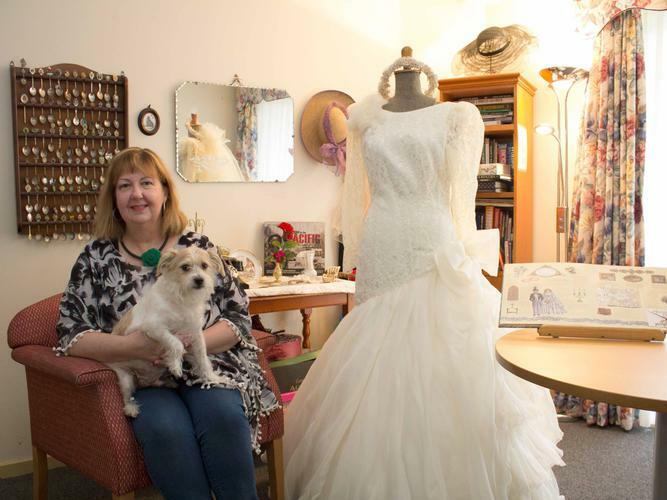 On Valentine’s Day, Ms Mahoney brought in her wedding dress to the Reminisce Corner. Clients loved the initiative and many joined in the conversations to share about their own special day. “Martine has a good understanding of older people and the things that are, and have been important to them in their lives,” Ms Vice adds.